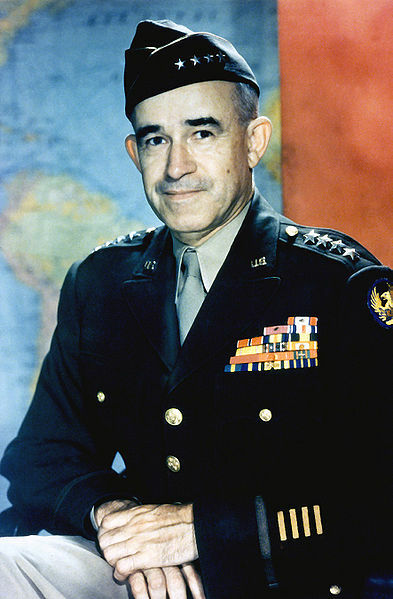 Omar Nelson Bradley (1893-1981) was a military officer in the United States Army, serving as a top commander in North Africa, Italy, France and Germany in World War II under General Dwight D. Eisenhower. 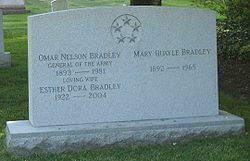 After the war Bradley headed the Veteran's Administration and was the first officer assgiend to the post of Charimain of the Joint Chiefs of Staff (1949-53) during the Korean War. He was the last surviving five-star commissioned officer of the United States. Omar Nelson Bradley was born-literally in a log cabin-near Clark, Missouri, on 12 February 1893, the only surviving child of schoolteacher John Smith Bradley and Sarah Elizabeth Bradley, née Hubbard. The environment of Bradley's youth in rural Missouri was impoverished, but he received a good secondary education, becoming a star player on the Moberly High School baseball team. Hunting to supplement the family income, he also became a crack shot. He went to work for the Wabash Railroad after high school graduation in order to earn enough money for college. However he received an appointment to the Military Academy at West Point in the fall of 1911. Some men had difficulty adapting to the demanding curriculum and strict military life at West Point, but Bradley confessed that the discipline, the rigors of a code of conduct centering on honor and duty, the structured society, and the opportunities for athletics greatly appealed to him. An enthusiasm for sports took time away from academics, but Bradley still managed to finish a respectable 44th in his graduating class of 164. He lettered both in football and in baseball, and later he commented on the importance of sports in teaching the art of group cooperation. 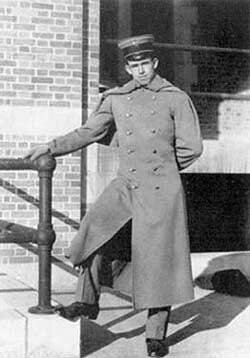 Bradley graduated in 1912 and joined the 14th Infantry Regiment's third battalion at Fort George Wright, near Spokane, Washington, where he was exposed to the old Regular Army life that was shortly to disappear forever. Under the tutorship of Edwin Forrest Harding, another second lieutenant who was six years his senior, Bradley began a lifelong habit of studying his profession. Harding was a natural schoolmaster who led a small group of lieutenants through weekly tactical exercises that broadened into discussions of military history and current operations in Europe. Few people had a greater influence on Bradley than Harding, who convinced him that an officer had to begin studying at the very start of his career and continue to study regularly if he hoped to master his profession. International crises soon put Lieutenant Bradley's developing military skills to their first, rather modest test. When the civil war in Mexico spilled over the border into the United States, American regulars under the command of Brig. Gen. John J. Pershing marched into Mexico in pursuit of the rebel commander, Pancho Villa. Because of the possibility of actual war with Mexico, the War Department called up the Texas, Arizona, and New Mexico National Guard and ordered more Regular Army units to the border. Among them was the 14th Infantry, which went into camp at Douglas, Arizona. Although Bradley saw no action on the Mexican border, he learned a good deal about handling troops in field conditions, conducting long motor marches, and maintaining discipline, morale, and training in unfavorable circumstances. In the midst of the crisis, Congress passed the National Defense Act of 1916, doubling the authorized size of the Regular Army and increasing the number of infantry regiments to sixty-five. As a consequence of the expansion, Bradley found himself promoted to first lieutenant seventeen months after graduating from West Point. The crisis with Mexico passed, but Bradley and his regiment remained in the Southwest until after the United States declared war on the German Empire. The 14th Infantry was stationed at Yuma, Arizona, when the United States formally entered World War I. Almost immediately; Bradley was promoted to captain as the Army began to mobilize. However, rather than moving to Europe, his regiment received orders to return to the Pacific Northwest, where it would police the copper mines in Montana. Throughout the next year, Bradley desperately tried to have himself assigned to a unit bound for the fighting in France, but to no avail. Bradley was promoted to major in August 1918, and shortly thereafter he received the much-desired orders to prepare for duty overseas. The 14th Infantry, with Bradley in command of its second battalion, became part of the new 19th Infantry Division, which was organizing at Camp Dodge, near Des Moines, Iowa. But the great influenza epidemic of 1918, coupled with the armistice in November, ensured that the division would never go overseas. With the war over, the Army rapidly demobilized and a frustrated Bradley never saw the battlefields of the Western Front. He was then posted to South Dakota State College, where he remained a year as an assistant professor of military science, reverting to his permanent grade of captain. In September 1920 Bradley began a four-year tour of duty as an instructor of mathematics at West Point, while Douglas MacArthur was serving as superintendent. Aside from the rigor of studying mathematics, which Bradley believed stimulated one's powers of reasoning, he devoted his time at the Military Academy to the study of military history. He was especially interested in the campaigns of William T. Sherman, whom he considered a master of the war of movement. By the time he was ordered to attend the advanced course at the Infantry School at Fort Benning, Georgia, in the fall of 1924, following a spring promotion to major, he had concluded that many of the men who had fought in France had been misled by the experience of that static war; for Bradley, Sherman's campaigns were more relevant to any future war than the battle reports of the American Expeditionary Forces. Since the curriculum at Fort Benning stressed open warfare, it gave Bradley the opportunity to become a specialist in tactics and terrain and the problems of fire and movement. He graduated second in his class, behind Leonard T. Gerow, another officer with whom he was to serve years hence, and ahead of officers who had combat experience in World War I. It was at Fort Benning that Bradley concluded that his tactical judgment was as good as that of men tested in battle. His Infantry School experience was crucial; as he later explained, "the confidence I needed had been restored; I never suffered a faint heart again." When his tour at Fort Benning ended, Bradley was assigned to the 27th Infantry of the Hawaiian Division. There he met George S. Patton, Jr., the division G-2, whose future would be intertwined with his for many years. Following a stint with the Hawaiian National Guard, Bradley returned to the United States in 1928 as a student at the Command and General Staff School at Fort Leavenworth, Kansas. The premier school for professional soldiers, Leavenworth was the eye of the needle through which any officer who hoped for success in the Army had to pass. Bradley was somewhat critical of the predictable and unimaginative instruction he received there, as he was of the hoary "school solutions" the faculty presented. Still, he judged that his year in Kansas stimulated his thinking about tactical problems and, voicing a conclusion shared by many of his peers, believed the real importance of the Command and General Staff School was that it gave his entire generation of officers a common tactical language and technique for problem solving. More important than Leavenworth, however, was Bradley's next assignment as an instructor at the Infantry School in 1929. The assistant commandant was George C. Marshall, who was determined to streamline and simplify tactical command procedures. Under Marshall's guidance, instructors encouraged student officers to think creatively about tactical problems and simplify doctrine so that it was meaningful for citizen-soldiers rather than just for an Army composed of professionals. Bradley judged that no one had ever had a more profound influence on him, either personally or professionally, than Marshall. Once having given a man a job, Marshall did not interfere, as long as the officer performed as he expected. Impressed with the results of Marshall's methods, Bradley adopted an identical hands-off style of command. Bradley's four-year Infantry School assignment also brought another intangible benefit. During this tour Bradley associated with a hand-picked company of "Marshall men," some of whom, including Forrest Harding, he had known before. Others, both faculty and students, and including such men as Joseph Stilwell, Charles Lanham, Walter Bedell Smith, Harold Bull, Matthew Ridgway, and J. Lawton Collins, were to hold important assignments in a very few years. Marshall's personal teaching, in part through the informal seminars he conducted for his staff, and the stimulating company of a group of officers devoted to the study of their profession rounded out Bradley's tactical education. Crucial to Bradley's future in the Army was the fact that he had made a favorable impression on Marshall. Bradley graduated from the Army War College in 1934 and returned to West Point to serve in the Tactical Department. At Fort Benning he had taught and associated with men who would lead divisions and corps during World War II. At West Point he trained cadets - including William C. Westmoreland, Creighton W. Abrams, Jr., Bruce Palmer, Jr., John L. Throckmorton, and Andrew J. Goodpaster, Jr. - who would command battalions in that war and lead the Army in the decades of the 1960s and 1970s. Bradley was promoted to lieutenant colonel in 1936. When he left West Point in the summer of 1938 for duty on the War Department General Staff, he had spent some sixteen years in Army schools as student and teacher. After a brief period in the G-1, the Army staff's manpower and personnel office, Bradley became assistant secretary of the General Staff in the Office of the Army Chief of Staff. At times inundated by the flood of paper, he and Orlando Ward, later assisted by Bedell Smith, filtered the mass of information directed at the Chief of Staff, framing problem areas and recommending solutions. In February 1941, as the Army was expanding in anticipation of war with the Axis Powers, Marshall promoted Bradley from lieutenant colonel to brigadier general, skipping the rank of colonel, and sent him to Fort Benning to command the Infantry School. At Fort Benning, Bradley supported the formation and training of tank forces, especially the new 2nd Armored Division, then commanded by George S. Patton, Jr. He also promoted the growth and development of the new airborne forces, which would play a critical role in the coming war. His most important contribution to the Army, however, was the development of an officer candidate school (OCS) model that would serve as a prototype for similar schools across the Army. When war came, the OCS system would turn out the thousands of lieutenants needed to lead the platoons of an Army that eventually fielded eighty-nine divisions. The Infantry Officer Candidate School at Fort Benning alone would produce some 45,000 officers. When the United States formally entered World War II on 8 December 1941, Bradley, at Marshall's suggestion, was preparing a hand-picked successor to take command at Fort Benning. Marshall had bigger challenges in mind for Bradley as the Army prepared for combat. Two months after Pearl Harbor, Bradley took command of the 82d Infantry Division. The unit had compiled a distinguished combat record in World War I, but it had been reactivated with draftees leavened by only a small Regular Army cadre. The new commander saw to it that incoming drafts of soldiers were welcomed with military bands; when they were marched directly to their cantonments, they found uniforms, equipment, and a hot meal waiting for them. Such practices did much to boost the morale of often bewildered inductees. Disturbed by the poor physical condition of the new soldiers, Bradley instituted a rigorous physical training program to supplement a tough military training schedule. He also invited Alvin York, Medal of Honor winner and the most famous alumnus of the division, to visit his troops. Based on York's remark that most of his own combat shooting had been done at very short range, Bradley adjusted the division's marksmanship program to include a combat course in firing at targets only twenty-five to fifty meters away. Bradley looked forward to taking the 82d Division to Europe or the Pacific, but barely four months later he received orders from General Marshall to take command of the 28th Infantry Division, a National Guard unit that Marshall believed needed help badly. Bradley turned over the 82d to Matthew Ridgway and went to Camp Livingston, Louisiana, to address the problems of the Keystone Division. Among the first steps he took was the reassignment of junior officers who were over age and unable to cope with field conditions; roughly 20 percent of all National Guard first lieutenants in 1941 were forty or older. The more senior officers who lacked the knowledge or skills for battalion and regimental command also found themselves transferred. He also reassigned officers and sergeants within the division to eliminate the "home-townism" peculiar to 1930s National Guard units, a system that hampered proper discipline. But the worst problems of the 28th Division were not of its own making. The division had been repeatedly levied for officers and noncommissioned officers; over 1,600 had gone to OCS or aviation training since the division was mobilized. Bradley put a stop to this drain in manpower and obtained new drafts from OCS to replace the losses. He then began a systematic training program that included the intense physical conditioning he had found necessary in the 82d. He also led the division through increasingly more complex tactical exercises at the battalion and regimental level, culminating in amphibious assault training on the Florida coast. Long experience gained from Army schools and from training recruits in World War I had much to do with Bradley's ability to turn the 82d and 28th into well-trained combat divisions. But he also clearly understood that citizen-soldiers were not professionals and that the Army could not treat them as such. He adopted George Marshall's view that doctrine had to be simplified for execution by soldiers and leaders who had no previous military experience. Indeed, his successes in 1942 owed much to an understanding of the discipline and training needs of citizen-soldiers that derived from Marshall's guidance at the Infantry School a decade earlier. In February 1943 General Marshall, having previously remarked that Bradley had been requested for corps command five or six times, ordered him to Austin, Texas, to take over X Corps. Before Bradley assumed that command, however, the orders were countermanded and he found himself en route to North Africa to work for his classmate Eisenhower, whom he had occasionally seen but with whom he had not served since graduation from West Point. Bradley arrived in North Africa in the aftermath of the Kasserine Pass debacle. He found a much-chastened Eisenhower worrying about the failure of American units to perform well against their more experienced German opponents. The local British commander had been especially harsh in assessing the initial combat performance of the Americans. Bradley's assignment was to serve as Eisenhower's eyes and ears, reporting on the situation on the Tunisian front and the means that might be used to correct the problems that were by then evident to everyone. One of his first important decisions was to advise Eisenhower to relieve Maj. Gen. Lloyd Fredendall from command of II Corps, whose troops had demonstrated a particularly poor performance at Kasserine. Eisenhower had been reluctant to take such drastic action despite the recommendations of key subordinates, but he finally acted after consulting with Bradley. When Eisenhower assigned George Patton to replace Fredendall, he also asked Bradley to become the corps deputy commanding general. Bradley then succeeded to command of the corps on 15 April when Patton left to continue his interrupted planning for landings on Sicily. Although Patton had restored discipline and confidence to II Corps, it still lacked the prowess of British units. Bradley's task throughout the remainder of the North African campaign was to convince both his men and the British that the American soldier was as good as any and that American leaders were as tactically adept as their Allied and Axis counterparts. During the final battles of April and May 1943 he achieved his goal. The II Corps attacked northward toward Bizerte, avoiding obvious routes of approach and using infantry to attack German defenders on the high ground before bringing up the armor. The 34th Infantry Division, maligned by the British as a unit with poor fighting qualities, fought the crucial battle and dislodged the Germans from strong defensive positions astride Hill 609, the highest terrain in the corps sector. With tanks in the assault role, the 34th Division infantry cleared the obstacle, allowing Bradley to send the 1st Armored Division through to victory. American troops entered Bizerte on 7 May, and two days later more than 40,000 German troops surrendered to II Corps. The fighting in North Africa was over, and the U.S. Army, as Bradley put it, had "learned to crawl, to walk-then run." He then immediately went to Algiers to help plan the invasion of Sicily, the next objective in the Allied timetable approved at the Casablanca Conference. Capture of Sicily would, the Allied leaders hoped, knock Italy out of the war and clear the central Mediterranean of Axis forces. It might also divert German forces from the Eastern Front, thereby partially satisfying Josef Stalin's continuing demands that the western Allies open a second front against the Germans. Under command of George Patton's Seventh Army, Bradley's corps was in the vanguard of the Operation Husky assault, and it moved inland against negligible resistance. The Germans and Italians were not surprised by the landings, however, and hard fighting began the second day and characterized the remainder of the 38-day campaign. By 16 August 1943, British and American forces held Sicily. The conquest of Sicily ultimately persuaded Italy to withdraw from the war, but the Allied operation was less than a complete success. Advancing from the south of Sicily along two axes of approach in a classic pincer converging on the port of Messina, the Allies allowed the German units to escape across the narrow straits to the Italian mainland. Bickering between American and British commanders also continued. On the positive side, American troops had learned a lot more about fighting. They had conducted their first opposed amphibious landings and airborne assaults, brought four new divisions successfully into battle, and taken a field army into war for the first time. It was during the fighting in Sicily that war correspondent Ernie Pyle "discovered" Bradley and established his reputation as the "soldier's general." Whatever its defects, the battle for Sicily was an important step in preparing Bradley for his next job. Shortly after the fighting ended, Eisenhower told him that he would command an army and then activate an army group in the forthcoming landings in France. Bradley traveled to the United States to select the staff for his new command, the First U.S. Army, then stationed at Governor's Island, New York. The headquarters deployed to England in October 1943, and Bradley took on the dual task of First Army commander and acting commander of the skeletal 1st U.S. Army Group (subsequently redesignated the 12th Army Group). Eisenhower, appointed as Supreme Allied Commander for the invasion of Europe, arrived in England in January 1944. Shortly thereafter he confirmed that Bradley would command the American army group when it was activated. But until the landings were secure, all American ground forces in northern France would be under the temporary command of General Sir Bernard L. Montgomery, who also commanded the British and Canadian ground contingents. For Operation Overlord, the assault on the Normandy beaches, the First Army was assigned three corps. The V Corps was commanded by Leonard T. Gerow, whom Bradley had known since his advanced course days at Fort Benning, and VII Corps was led by J. Lawton Collins, a division commander who had proved himself in the Pacific and a man whom Bradley had known during his teaching tour at Benning. The XIX Corps, under command of Charles H. Corlett, would follow the other corps ashore to establish the beachhead. Almost alone among the senior Allied commanders, Bradley believed in the value of airborne landings both to limit enemy access to the coast from inland and to spread confusion in the German defenses. He therefore fought to have the 82d and 101st Airborne Divisions dropped behind UTAH Beach on D-Day. During the months before the invasion, Bradley supervised the refinement of assault plans and troop training. He and his corps commanders finally decided that the assaults would be led by the 29th Infantry Division and elements of the experienced 1st Infantry Division on OMAHA Beach, and by the 4th Infantry Division on UTAH. Both assault forces would be supported by the new duplex drive M4 tank, a Sherman tank fitted with flotation skirts and propellers, which could be launched from landing craft and swim ashore. Bradley decided American units would not use other specialized tanks, including the "flail" tanks that cleared minefields and tanks with flamethrowers, because they required specialized training and an extensive separate supply and maintenance organization. Some have contended that this decision to keep a lean supply system cost the lives of many soldiers who died from mines and booby traps on the Normandy beaches and during the subsequent breakout. On the morning of 6 June 1944, Bradley was aboard the cruiser USS Augusta, his headquarters for the invasion. He received word that the Germans had moved the 352d Infantry Division into the area for training, an unfortunate event that lengthened the odds against V Corps. However, he did not change his battle plans. At 0630 American troops and their Allies assaulted the Normandy beaches. Meeting only light resistance, the 4th Infantry Division suffered very few casualties and quickly secured UTAH Beach. The VII Corps pushed six miles inland by the end of D-Day. On OMAHA Beach the situation was a nightmare. The German regiment there, reinforced by troops from the division that had unexpectedly arrived, occupied terrain favorable for defense and put up a stiff resistance. Landing craft launched most of the amphibious tanks too far out from the shore, where most foundered and sank. The aerial bombardment was almost completely ineffective in suppressing German defenses, and many of the assault troops were put ashore at the wrong places. For several hours the situation appeared to be a disaster in the making. Casualties were heavy, particularly among the demolition engineers assigned to clear the beach obstacles for following assault waves. The infantry, pinned down on the tide line, was also hard hit. In the end good leadership and naval gunfire resolved the situation. Determined and courageous American commanders led their men in desperate local fights against the German position and slowly established a foothold. U.S. Navy destroyers, ignoring the hazards, navigated close inshore and fired directly into German strong-points. When Gerow finally established communications with Bradley, his first message was "Thank God for the U.S. Navy!" Hamstrung by scanty communications with the troops ashore, Bradley quietly worried over what appeared to be a developing catastrophe. For a time he considered evacuating the troops and sending follow-on assaults to UTAH or the British beaches. At last, in the early afternoon, Gerow reported that his men were beginning to reach the bluffs above the beach. By evening the crisis was past, and V Corps had 35,000 soldiers ashore on a beach five and a half miles long and a mile and a half across at its widest point. At a cost of around 2,500 casualties, the Allies had established themselves firmly on the Normandy coast. On 9 June Bradley moved First Army headquarters ashore. British and American forces repelled German counterattacks against the beachhead throughout the first half of June, including an assault by the 17th SS Panzer Grenadier Division designed to pierce the junction between the U.S. V and VII Corps. Using information code-named ULTRA (from the Ultra Secret classification assigned to the sophisticated code-breaking process), Bradley shifted the newly arrived 2d Armored Division to crush the German attack. Meanwhile, follow-on forces were steadily landing on the invasion beaches, and the Allied lodgment became secure. Over the following month Bradley sent VII Corps to capture the port of Cherbourg and expanded the beachhead into the hedgerow country behind the coast, preparing for the breakout envisioned in the Overlord plans. The first attempts at breaking out of the lodgment failed in the face of heavy German opposition. Bradley then conceived a plan for a one-corps attack centering on St. Lo, using heavy air support. Operation Cobra began on 25 July with a saturation bombing attack that fell on both American and German positions. Collins' VII Corps nonetheless assaulted on schedule. After pushing through the German lines, he committed two armored divisions to exploit the breakthrough. On Collins' right flank, Troy Middleton, commanding VIII Corps, likewise released an armored division after his infantry broke through the initial German resistance. In a 35-mile advance, the American armor reached Avranches and began a rout of the Germans that lasted just over a month, by which time the Allies had closed on the German frontier. With the breakout, Eisenhower activated Third U.S. Army with George Patton in command. Bradley turned First Army over to Courtney Hodges and activated 12th Army Group, which on 1 August assumed command of 21 divisions comprising some 903,000 men. No officer in the U.S. Army had any practical experience with the operations of an army group-few had even served in a division before World War II. Bradley finally decided to model his command technique on that of Sir Harold R. L. G. Alexander, the British general with whom he had served in the Mediterranean. Instead of providing only broad operational direction, as the vague prewar American doctrine foresaw for army group commanders, Bradley planned to exercise close control of his armies. He decided to assign broad missions to his principal subordinates and then carefully monitor operations, intervening on a selective basis when he thought necessary. Bradley on August 13, 1944, unexpectedly halted the advance of Patton's XV Corps, stopping it 25 miles from its juncture with Canadian forces moving south. The Allies thereby failed to close the Argentan-Falaise pocket containing the almost-surrounded German forces. About 240,000 German troops (and 30,000 vehicles) escaped through the gap, avoiding encirclement and almost certain destruction. Bradley, over-cautious, had assumed that incorrectly the Germans had already mostly escaped, and feared a German counterattack against overextended Americans. Bradley later admitted a mistake had been made, but blamed his superior Montgomery, as did Eisenhower, for moving the Canadians too slowly. Bradley underestimated the effectiveness of the Allied air forces in stopping all German movements during the daytime, thus making a counterattack highly risky for them. The opportunity existed because Hitler had refused to allow his army to escape until August 16. In broader perspective, Bradley, with Montgomery. had in 10 weeks destroyed the powerful German armies holding strong defensive positions and pushed the enemy back into Germany. In practical terms, the battle determined the future course of the war. Hard fighting in Normandy, followed by the pursuit across France through the end of September 1944, wounded or killed more than 500,000 Germans and destroyed many divisions. The famous 12th SS (Hitlerjugend) Division, for example, literally dissolved as a fighting formation. Taken together, Normandy, the Falaise pocket, and the retreat across the Seine reduced the German Army to an infantry force with limited tactical mobility. German equipment losses were staggering: some 15,000 vehicles were destroyed or abandoned. Less than 120 of more than 1,000 tanks and assault guns committed to battle in Normandy remained operational in September. Few panzer divisions could muster more than a dozen tanks. The Allied armies were quick to exploit German weaknesses, closing to the borders of Germany by the fall. Assigning Hodges and Patton the mission of pursuing the retreating enemy, Bradley gave both commanders wide latitude of action and turned his attention to the growing problem of supplying forces that daily moved farther away from the invasion beaches. But neither he nor Eisenhower could significantly improve the logistical situation until the Allies captured usable ports. By September the 12th Army Group was running out of supplies and encountering stronger German resistance along the Siegfried Line. With priority given to Operation Market-Garden, an attempt to capture Arnhem and a bridge over the Rhine River, large-scale American movement essentially halted and First and Third Armies continued only limited offensives. On 16 December 1944, the Germans attacked in the Ardennes, an area that Bradley had left thinly garrisoned as a calculated risk. Eisenhower quickly determined to convert the attack into an opportunity to break the back of the German Army. Bradley, agreeing with Eisenhower's assessment, reorganized his forces to meet the threat and exploit the situation. He directed Patton to reorient his attack to the north, with the aim of relieving American forces besieged in Belgium. In what was probably his most impressive performance, Patton marched his divisions almost one hundred miles in bad weather in two days to attack the German left flank and link up with the 101st Airborne Division at Bastogne. Meanwhile, First and Ninth Armies fought tenaciously to contain the German attack, turning the Ardennes offensive into an unmitigated catastrophe for the German Army. German losses were not substantially higher than American losses in the fighting, but the battle cost the Germans the bulk of their skilled troops, eradicated their operational reserve, and destroyed great quantities of modem equipment. The Battle of the Bulge made the great victories of 1945 possible because it eliminated the German Army's ability to resist the final offensives into its homeland. In January 1945, having defeated the German winter attacks, Bradley began a series of continuous offensives that smashed through the Siegfried Line, crossed the Rhine, crushed the remains of the German forces in the Ruhr, and finally met the Soviets on the Elbe River. Since September 1944, and even earlier, the Allied commanders had debated the best way to end the war militarily. Eisenhower, in consultation with Bradley and Montgomery well before D-Day, had stipulated that the main Allied objective in Germany was the Ruhr valley, Germany's industrial heartland. A threat to that critical area would oblige the Germans to commit their remaining ground forces for its defense. In general terms, Eisenhower and his senior commanders envisioned an encirclement of the Ruhr that would capture the German industrial base and the bulk of the German Army at the same time, thus bringing the war to a close. The means of doing this remained controversial. Montgomery favored a single "knife-like thrust" from the north, under his command, to which all Allied resources would be committed. However, that concept, as embodied in Operation Market-Garden, proved unsuccessful. In contrast, Bradley supported Eisenhower's determination to pursue a broad-front attack that was as important for domestic political reasons as for military ones. Once at the Rhine, chance presented him with the opportunity for improvisation. The retreating Germans had methodically destroyed Rhine River bridges to strengthen the defensive value of their natural barrier. The 9th Armored Division, under the command of Bradley's classmate John Leonard, captured intact the Ludendorff railway bridge at Remagen on 7 March. The structure had been rigged for demolition with explosives, but inexplicably had not been destroyed in a timely manner. Informed of that stroke of luck, Bradley ordered First Army commander Courtney Hodges to push as many forces as possible across to the east bank of the Rhine and secure the bridgehead. He then obtained Eisenhower's approval to put as many as five divisions into an attack. Bradley saw the possibility of now striking at the Ruhr from the south, up the valley from Frankfurt, rather than from the British sector in the north. By 16 March he had pushed two corps over to the east bank of the Rhine and kept them moving toward the main north-south autobahn. At the same time he ordered Patton to seek a Rhine crossing in the vicinity of Oppenheim and then to drive north toward Giessen, where he was to link up with First Army. Patton crossed the Rhine with little difficulty on 23 March and immediately began his attack to the north. By 28 March First Army had driven from the Remagen bridgehead through the Lahn valley and beyond Giessen to Marburg, where its III Corps met XII Corps of Patton's Third Army. The stage was set for the final campaign of the war in Europe. Bradley planned to swing his Ninth Army south and First Army north in a double envelopment that would encircle the Ruhr and meet in the vicinity of Kassel. Once that was accomplished, he intended to detail some units to mop up the Ruhr and then attack with Ninth, First, and Third Armies from Kassel toward Leipzig and Dresden, halting at the Elbe River where American forces were to meet the Soviets. The operation developed very much as Bradley planned, with the pincers closing around the Ruhr on 1 April. By 12-13 April American units had reached the Elbe River. Bradley's troops had captured in excess of 315,000 prisoners, more than had been taken at Stalingrad or in Tunisia. In a final offensive Bradley sent Patton's Third Army to attack along the Danube into Bavaria, Austria, and Czechoslovakia, cementing the Allied success. At the end of operations in Europe, Bradley's 12th Army Group was the largest ever commanded by an American general. It consisted of Lt. Gen. Courtney Hodges' First, General George Patton's Third, Lt. Gen. William Simpson's Ninth, and Lt. Gen. Leonard Gerow's Fifteenth Armies, a force comprising 12 corps, 48 divisions, and 1.3 million men. From the time of the TORCH landings in North Africa through the end of the war, Bradley was indispensable to Eisenhower, who greatly valued his perennial calm, understated professionalism, and sound advice. Since 1943 he had been intimately involved in every crucial decision that determined the outcome of the war in Europe. The Supreme Commander saw Bradley as "the master tactician of our forces," and at the end of the war he predicted that Bradley would eventually be recognized as "America's foremost battle leader." Months before the end of the war in Europe, Bradley had asked General Marshall to keep him in mind for an eventual command in the Pacific. Once Germany capitulated, it became evident that General Douglas MacArthur did not require another army group commander for his planned assault on the Japanese home islands. Bradley was still in Germany when news of the Japanese surrender reached him. 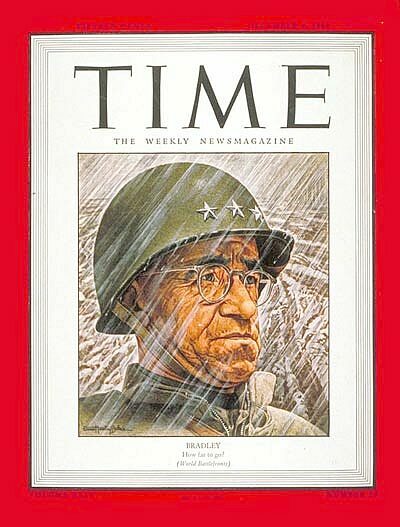 President Harry S. Truman, it turned out, had other plans for Bradley. On 15 August 1945, he appointed him to direct the Veterans Administration (VA). Somewhat unwillingly, Bradley accepted the job and began to modernize and restructure that antiquated organization to meet the challenges that it would soon face. Before the end of the war the VA was responsible for some 5 million veterans, with a few pensions still going to cases arising from the War of 1812. By 1946 almost 17 million veterans were on its rolls. Bradley completely rebuilt the organization on a regional basis and insisted on basing his decisions on the needs of the veteran, rather than on the political considerations that had so often governed in the past in such matters as the location of VA hospitals. With the help of Maj. Gen. Paul R. Hawley, Eisenhower's theater surgeon, he completely overhauled a medical care system that Hawley had described as medieval. He also revised and extended the educational benefits of the G.I. Bill, arranged for jobs and job training programs for men whose only experience had been as members of the armed forces, established a program of loans for veterans, and administered a staggering growth in veterans insurance and disability pensions. Bradley was unable to accomplish everything he had hoped to do in his two-year tenure, but in the assessment of the press, he transformed "the medical service of the Veterans Administration from a national scandal to a model establishment. On 15 August 1953, Bradley left active service. In the twenty-eight years before his death in 1981, he occupied himself in industry and was periodically consulted by civilian and military leaders. He retained an active interest in the Army, spoke at its schools, and frequently visited units and met with soldiers of all ranks. A quiet but distinguished member of a distinguished class of West Point graduates, Bradley typified a remarkable generation of Army officers. Disheartened by a perceived lack of success in 1918, he pursued his duty throughout some of the Army's most difficult years. The fact that war coincided with Bradley's own professional maturity brought him promotion as the first general officer in his class; George Marshall's confidence assured him a chance to show his mettle. There is no standard against which to compare Bradley as an army group commander. During the fighting in Europe, his calm and effective presence was important in times of crisis, as was his deft touch in handling subordinates. It is difficult, for example, to imagine Patton without Bradley, who exploited the talents of that, volatile commander as well as any man could have done. Finally, it was his superb wartime record, combined with his reputation for fairness and honesty, that made him effective in what was probably his most difficult job, Chairman of the Joint Chiefs of Staff. General of the Army Omar N. Bradley died on 8 April 1981, just a few minutes after receiving an award from the National Institute of Social Sciences. He was buried in Arlington Cemetery on 14 April 1981 with full military honors, as the nation mourned the passing of this great and noble warrior.